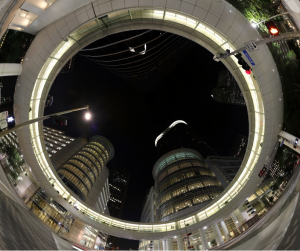 360 Gigapan Allen Center Circular Skywalk Night 1400 Smith St. Houston, TX 77002. Shot on 8-23-13. This shot includes the former Four Allen Center, former headquarters of Enron and now owned by Chevron. Copyright 2013 Douglas Robertson for Citizen Doug Productions. This entry was posted in Gigapans and tagged 1400 Smith St, 360, 77002, Allen Center, Chevron, Circular Skywalk, Enron, Four Allen Center, geotag, gigapan, gigapixel, houston, night, panoramic, TX. Bookmark the permalink.